What does the Us ending actually mean? The Us ending is a shocker. 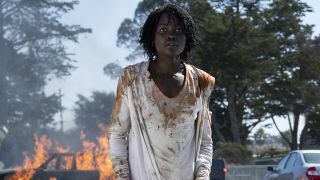 If you were expecting Jordan Peele's latest movie to be as straightforward as Get Out, you probably got a side of WTF with your popcorn at the movie theater. While it starts out simple enough - a family faces a home invasion, but the invaders are their doppelgangers - Us is a twisted tale with a sewing kit's worth of plot threads, and the Us ending does not tidy it all up. Right down to the final scene, we're left to decide what happened exactly and what it all means. As the credits roll, there's a lot left up to the audience to interpret, so we’re going to be discussing the big questions - with major spoilers - we have after watching the Us ending. 1. Do Adelaide and "other" Adelaide remember they've switched places? The red boiler suit, other version of Adelaide is clearly two sandwiches short of a picnic and explains in her croaky voice that all of the "tethered" have, understandably, gone mad in their underground home. What isn't clear is if she remembers life above ground. Similarly, we never know if our Adelaide remembers that she came from underground, and swapped places with her above ground double. She learned to speak, dance, and fit in with normal society, seems a successful, functional adult with a loving family, so is her former life as a tethered just a blur? She's jumpy about their return to Santa Cruz, but it seems more like the normal anxieties of someone with some bad memories, rather than a sense of guilt or fear that the doppelganger she doomed to hell will come after her. And when she smiles at her son in the closing moments of the film, is it to reassure him? Or the smile of someone who has gotten away with escaping hell and deceiving those around her? 2. Why didn't normal child Adelaide try to escape? So normal, child Adelaide was choked and handcuffed to the bed, while her evil doppelganger went to live above ground. Why didn't she just make a run for it at the first opportunity? She has to have gotten out of the handcuffs eventually, and from what we see in the movie all that stands between her and the outside is some tunnels and an escalator. Did her new tethered family stop her? Did she go crazy pretty much straight away? Is there some other force that keeps the tethered below ground? Is running the wrong way up a moving escalator just too much cardio? 3. How does the tethering work? I feel like I need to get hold of Jordan Peele's notebooks on this, because I have so many - some pretty gross - questions. "Other" Adelaide says she had to marry and have children because Adelaide did, and in the flashback we see the people in the tunnels making the same movements, below ground. How did this work practically? Movement? Impractical but fine. Conceiving and having an identical baby? That suggests some strange, supernatural, magical connection. We get to see the power of the connection in Jason and his arsonist copy who walks backward into flames, but how were the other tethered able to break the connection enough to leave the underground and attack? Also on my list of tethering questions: What happens when people die? (We know their doppelgangers don't die because of the murders in the movie). Do the tethered poop when their counterparts poop? So. Many. Questions. 4. But wait, Adelaide had swapped places, but she was still tethered? Yes, so in her case, the original Adelaide trapped in the tunnels was forced to act out the life of the doppelganger Adelaide who had taken her place above ground. Ballet class, childbirth, the whole shebang. Is it whoever is above ground who gets control? 5. Why do they all have scissors? I'm no expert on creating soulless clones and leaving them entirely unsupervised underground, but I don't think I would leave them all with giant pairs of gold scissors. Are they all trainee hairstylists? Were they really into papercraft? We may never know. 6. What sort of government experiment was it? The tethered are described by mad Adelaide - and bear in mind she's cuckoo for coconuts and perhaps not the most reliable witness - as soulless copies created to try and control the people above ground. But how? Why? And what sort of government just leaves a failed experiment like that living on underground with apparently unlimited access to rabbits? Are they clones? Why not just kill them all? Peele has said in interviews that there's an "elaborate mythology" behind the movie, but what the hell is it? 7. Who are the tethered meant to represent? This is a big one that could have intellectual types going for a whole series of podcasts. Some have suggested that in their red - the color of the US Republican party - jumpsuits, the tethered represent the working class of America that rose up to elect Trump. Another interpretation is that they represent the poor, forced by mere circumstance of birth to live alongside those enjoying nice cars and vacations and Amazon Echos, and finally mad enough at the injustice to take it for themselves. The line "we are Americans" definitely hints as socio-economic commentary, but it's left to the viewer to decide just what that comment is. 8. Where did all the rabbits come from? The final, and most important question is who the hell was looking after those rabbits? Will Us make it onto our best horror movies of all time list? Maybe, but for now, here’s the other upcoming horror movies you should watch out for.